Summer Classics at St. John’s College in Santa Fe, New Mexico is your chance to explore the perplexing, the rousing, and the compelling. 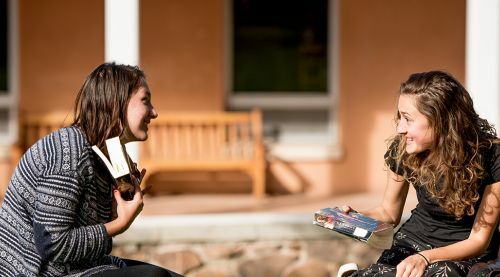 Every summer, people from across the country—varying widely in age, academic and professional backgrounds—gather in small seminars on the Santa Fe campus to read and discuss timeless literary, philosophical, and artistic works. This year’s theme, The City and the Soul, offers a chance to explore the complex relationship between the individual and society through multiples lenses: political theory, philosophy, literature, and film, among others. Whether we are wrestling with the dynamics of leadership in Machiavelli’s The Prince, examining the breakdown of 19th-century class systems in George Eliot’s Middlemarch, or addressing the tensions between patriotism and nationalism in Giuseppe Tomasi di Lampedusa’s The Leopard, we reflect on the myriad points of intersection between individuals and their communities. To keep up to date, join the 2019 Summer Classics mailing list to receive e-notifications or a mailed brochure. A Summer Classics seminar is not a lecture, nor is it a book club. At St. John’s, seminars are lively, in-depth, highly participatory conversations on the reading at hand. Discussions begin with an opening question presented by a tutor, but can take on a myriad of dimensions. Everyone contributes in some way to the conversation, bringing ideas to the table whether they have expertise in the topic or not. Listening is just as important as speaking. No previous knowledge of the author, text or subject is required; participants should refer only to works the group studies together. Conversations are not debates. Challenging others’ ideas or offering alternative thinking is encouraged. These week-long seminars take place in July, and are limited to 18 participants each. Groups are led by two members of the St. John’s College faculty, called tutors. Tuition covers one seminar in a given week. However, participants are welcome to register for a class in both the morning as well as the afternoon sessions. They are also welcome to register for more than one week of seminars. Summer Classics is an adult education program. Persons under the age of 18 may participate, but a parent or guardian must accompany minors in both the classroom and associated program activities. For persons under the age of 18 who would like to participate in a St. John’s seminar, we invite you to explore our Summer Academy. When not reading or in class, participants will have time to explore the vibrancy of historic Santa Fe.